For the uninitiated, “Hackathons” – surprisingly, a good thing – unsurprisingly got their start in the software development, with people coming together in a sort of highly concentrated creativity fest. In a common model, people take a defined measure of time to explore any idea they want, presenting their results to the group at the session’s end. The concept also has spread to a wide variety of other industries and evolved into other formats. 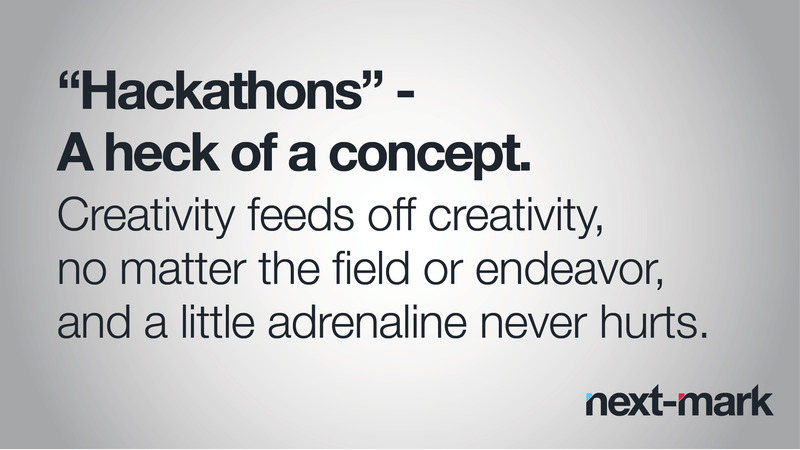 While the term hackathon may not be in everyone’s vocabulary, it’s a concept we long have embraced. In marketing communications we’ve found, a fixed brainstorming session can produce the kind of rapid-fire ideas that can get lost in over-thinking. It’s not an end point, of course, but it can be a solid jumping-off point for further refinement. When working with clients in similar sessions, we often ask that stakeholders other than management and marketing be included. Often this group includes product representatives and sales people, who can know more about prospects’ and customer’s expressed needs than most. Customer service staff can give insight into most frequent complaints, and design engineers are well versed in the pluses and minuses of a product. The point isn’t to crowd the room, but to give some thought to who could contribute some valuable thoughts from their perspectives and give them a little creative free rein. As noted, hackathons take many forms these days, including competitions and purpose-driven projects, such as improving government or transit systems. The best thing about them, from our perspective, is that they start with a problem, move through “what ifs” and, when successful, produce something impactful. Creativity feeds off creativity, no matter the field or endeavor, and a little adrenaline never hurts. We’re excited to see where hackathons go next and what we all can learn from them.